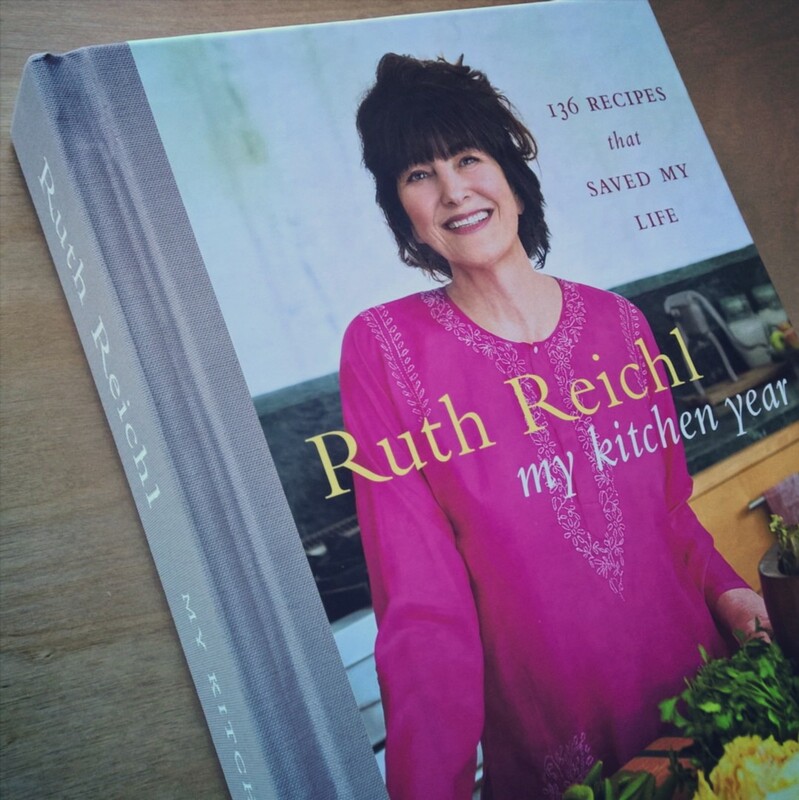 Reading isn't something I make much time for these days, so Ruth Reichl's latest book, My Kitchen Year: 136 Recipes That Saved My Life, sat on my nightstand for several weeks. In a nutshell, it's a memoir and a cookbook - documenting the year after Gourmet Magazine closed, and her role as editor abruptly ended. And really, my reading style fit this book perfectly, as the format consists of alternating story and recipes, so I could read one or several sets at a time, and easily pick it up again at a later date. Considering I used to be as addicted to cooking as I currently am to sewing, I remember what it feels like to let one's emotions find sanctuary in the kitchen. Though my tastes were never quite as exotic as Ms. Reichl's, I still enjoyed reading about them, though many of the recipes are perfect for day to day. The way she shares recipes in My Kitchen Year is almost conversational, which I found enjoyable, and there are several I'd like to try. It seemed only right that I make at least 1 before I wrote about the book here, and I chose 1 that was simple but oh so tasty - A Custard in a Crust. 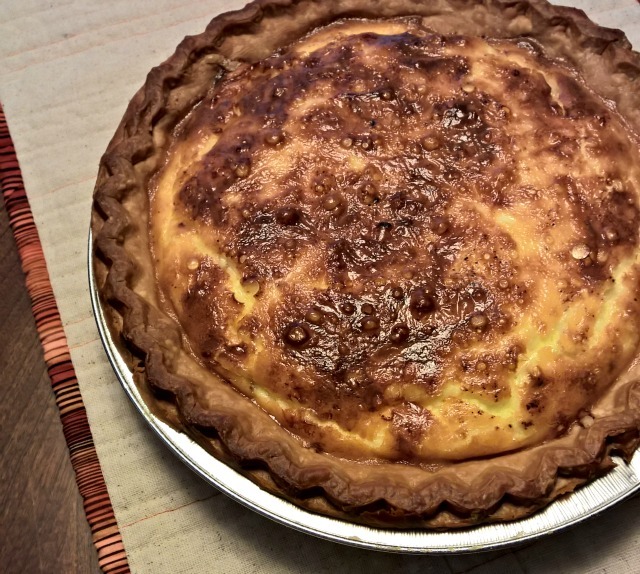 Now I have a favorite quiche recipe - one of those dishes that I don't make often, but when I do, I make it rich and satisfying. The one in Ruth's book is of the simplest sort - a purchased pie-crust, cheese, and custard. Sprinkled with nutmeg, it wasn't fancy to look at, but it sure tasted like it was. There were a couple of interesting features of the book. One was that Ruth shared Twitter tweets throughout the book. It took me a while to realize that's what they were - I thought they were bits of poetry. And many pretty much were, while being peeks into her world at the time. Also, a single gifted photographer, Mikkel Vang, photographed alongside Ruth as she cooked for the book, and the results are stunning. Being a big fan of Ruth's other books (my favorite being Tender at the Bone: Growing Up at the Table), I enjoyed reading about this more recent chapter of her life. If you enjoy food-talk at all, beautiful food photography, or recipes that have gotten someone through, I think you'd enjoy it too. can't wait to get my hands on this one. It was you who turned me on to Ruth's earlier books & I thoroughly enjoyed them! I was given Ruth's other books for a birthday present and enjoyed them very much, I'm now hoping that person will buy this book. I too, like the style of book where it alternates recipes and stories, it makes it much more readable. I love Ruth Reichl's writing - I read Garlic and Sapphires many years ago now, and am wondering whether I should revisit it... Sadly My Kitchen Year doesn't seem to be out on Kindle yet. When I read about Gourmet Magazine's closing, I went right out and bought that final copy. I'd been buying it at the newsstand off and on, but knew I wanted that one. So glad to read that she's come out with a new book as I've read her other two. I subscribe to Bon Appetit, but it's just not the same as Gourmet. . .Great post!